Lakes Formed By Meteor Impacts Are Called? Which Soda Company Briefly Owned A Sizable Naval Fleet? There’s a wide variety of lake types on Earth, simply because a lake is a large body of water surrounded by land with a basin shape—and there are many ways earth can be carved away to create a basin that water can accumulate in. Rift (tectonic) lakes appear in the rift zones formed by the deformation and resulting lateral and vertical movements of the Earth’s crust, crater (volcanic) lakes appear in the craters and calderas of dormant volcanoes, and fluvial lakes are produced by running water (i.e. plunge pool lakes, fluviatile dams, and meander lakes). 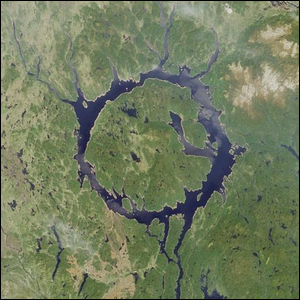 Rather rare among lakes, however, are annular lakes—circular lakes created by the impact of meteors. One of the largest such lakes is Lake Manicouagan, located in Quebec, Canada. Not only is the lake notable for its size, but it’s also notable for the novel geography of the region. In the 1960s, the Daniel-Johnson Dam was built and used to flood the earlier Lake Mushalagan (Mouchalagan) to the west of the central plateau and the then-smaller Lake Manicouagan to the east of the central plateau, isolating the central elevated land area (which is now known as René-Levasseur Island). The area is referred to as the Manicouagan Reservoir, which acts as a giant headpond for the Manicouagan River. The end result is a rather curious contrast: the land area of René-Levasseur Island, at 780 mi² (2,020 km²) is greater than the surface area of the surrounding annular lake, at 750 mi² (1,942 km²). The entire arrangement is so large and distinct that it can be seen from space and is referred to as the “Eye of Quebec”.